Previous article: Allow Time for Repetition and Concentration from Montessori at Home! Are you wondering where to get started in Montessori, or where to place the most emphasis? Don’t forget to focus on what could be considered the most important area of a Montessori classroom – practical life, or daily living, exercises. 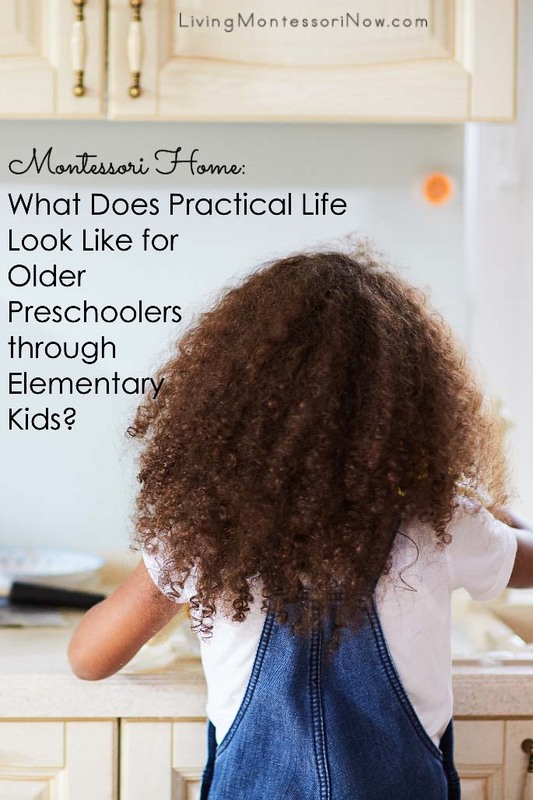 Practical life exercises can be used for preschoolers in almost any setting – whether it’s just a few activities at home, a homeschool classroom, church school, or classroom of any educational orientation. The reason practical life activities are so important is that they help your child develop order, concentration, coordination, and independence. By developing those qualities, both the child and the learning environment are calmer and learning is easier. This photo is from the Montessori-based Catechesis of the Good Shepherd program I had started in our church when my children were little. You’ll notice that the activities are generally inexpensive and easy to set up. I like to keep the practical life materials the same color on one tray whenever possible to make the activity attractive – and to make it easy for children to return the materials to the proper tray. You can set up practical life activities however works best for you, though. In addition to the preliminary exercises, there are four main areas of practical life: care of self, care of the environment, control of movement, and grace and courtesy. Use the activities you think will interest and benefit your child at the moment. Change the practical life activities periodically. 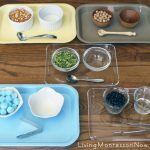 Montessori Primary Guide has a great introduction to the practical life activities with activities for each of the main areas along with videos to help you understand how to demonstrate activities using Montessori techniques. Montessori Print Shop (top photo in collage) has a wonderful overview of the Montessori practical life program with scope and sequence. To the Lesson! has many helpful practical life posts, including a post about the significance of practical life and their practical life shelves at the beginning of the year (middle photo in the collage). 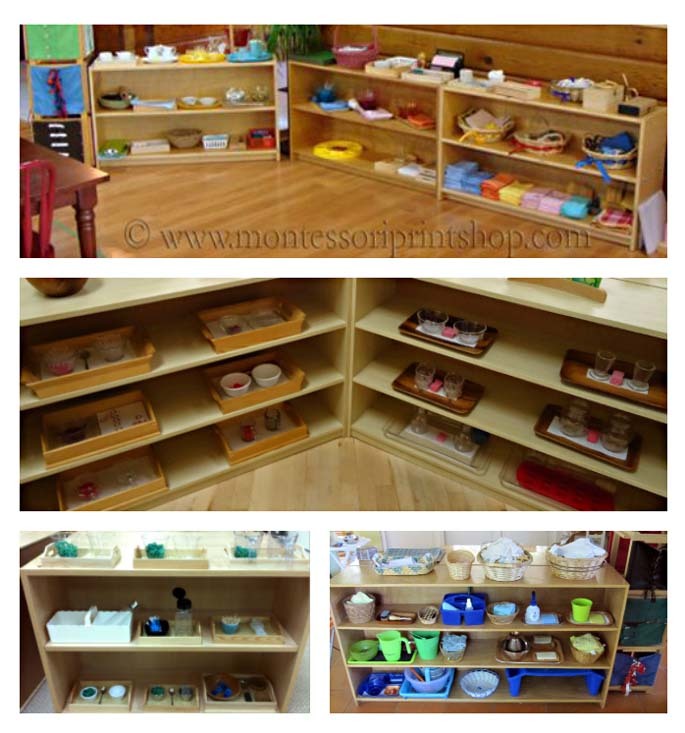 Trillium Montessori has a year of Montessori fine motor shelves, including photos of their shelves at the beginning of the school year (photo in the lower left of the collage). 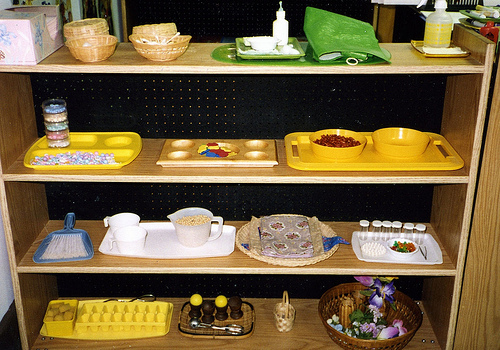 Blue Sun Montessori (photo in the lower right of the collage) has three photos of practical life shelves with numerous activities and listings of the activities on each shelf. 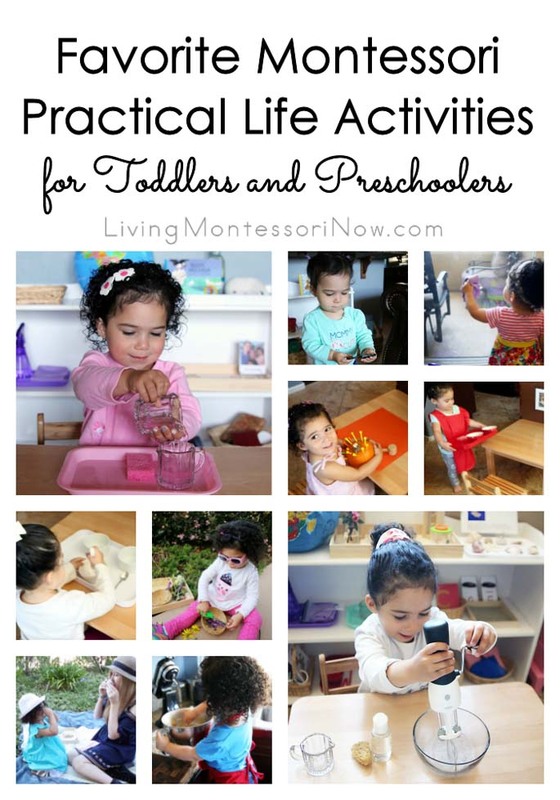 Montessori World has a free online album with many practical life activities. Montessori Album has a number of practical life activities with presentations. Wikisori has many practical life activities. 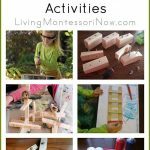 My Montessori Journey has a listing of practical life activities for the beginning of the school year. I have a post with information about free online access to comprehensive Montessori scope and sequence from Montessori Compass and The Montessori Foundation. 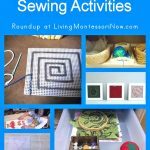 I have a category with many posts of practical life activities (including favorite Montessori practical life activities for toddlers and preschoolers) that are easy to duplicate at home. 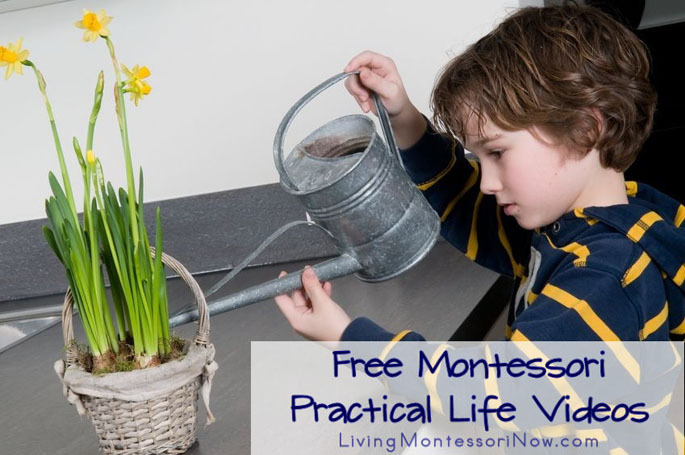 You’ll find many practical life activities at our Living Montessori Now YouTube channel. 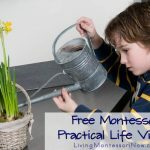 I also have a list of free Montessori practical life videos. 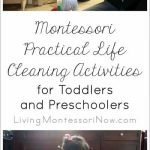 I also have a post with practical life activities for older preschoolers through elementary-age kids. 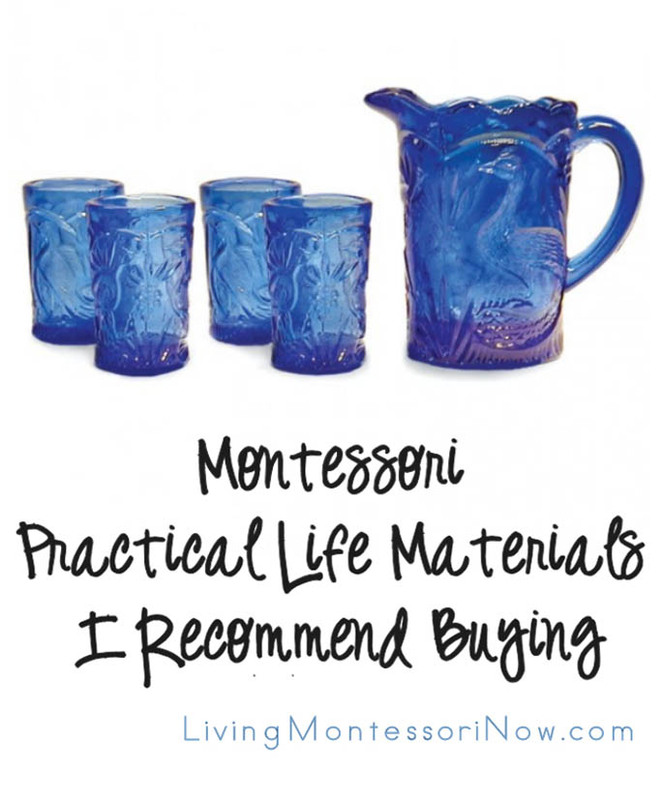 If you’re a homeschooler, check out my list of Montessori practical life materials I recommend buying. Does your child have a favorite practical life activity? Previous Post: « Allow Time for Repetition and Concentration from Montessori at Home! This is very helpful and I look forward to your Monday posts! Thanks so much, Mari-Ann! You always do a great job with your activities. It was fun to hear which are your son’s favorites when he has so many wonderful activities to choose from! This is one of my favorite aspects of Montessori teaching, the practical life aspects of it. Thanks for sharing ALL these great links, I’ll be working on visiting them all and looking forward to your upcoming posts! Thanks for your kind words, Michelle! There is a lot of information at those sites – have fun! Thanks so much for joining in on Mingle Monday fun. I hope you have a great week. I’m SO excited that you’re Stumbling my post!! Thanks so much, Robyn, and have a great week! Thanks for your comment, Alana! I love hearing what people remember clearly from their years in Montessori. I think teaching grace and courtesy is so important. I guess that’s why I did my master’s dissertation on it and have a book almost finished on the topic! What a wonderful shelf and full of great ideas. Practical life is also one of my favorite areas! Thanks, Kyle! I’m glad you found it helpful! I always loved the start of the school year and thinking of new activities to add to the shelves. My daughter loved “bedtime”, making beds for dolls and toys out of boxes and tucking them in. When she tried to make her brother go to sleep he say too active for bedtime, so he would wake up to make breakfast for everyone. That’s a life skill I hope he keeps when he’s married! Thanks for your comment, Cassiopeia! That is definitely a good life skill to keep in marriage!! Thank you for sharing. I am excited to see your Monday posts! I would love to see those trays up close to see what some of them are. Is there a way to zoom in on them? Thanks, Val! I think I have it set now so you can click on the photo and go to my Flickr account. There you can see a larger size of the photo. Thanks for stopping by new place!! Great post I’m Stumbling! I’m back once again and LOVE your blog and you more than ever! Great post Deb! Thanks for joining in the Hip Homeschool Hop! Thanks, Meghan – you’re always so sweet! I love Hip Homeschool Moms and you, too! 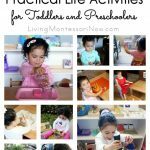 I was talking to someone today at Church about ways to get my almost 2 year old engaged during the day (since she homeschooled 5 kids) and she told me to google Practical Montessori Activites and that is what led me to your blog. Awesome list of resources! Thank you! I just found your comment, Rebekah! Thanks for your kind words!